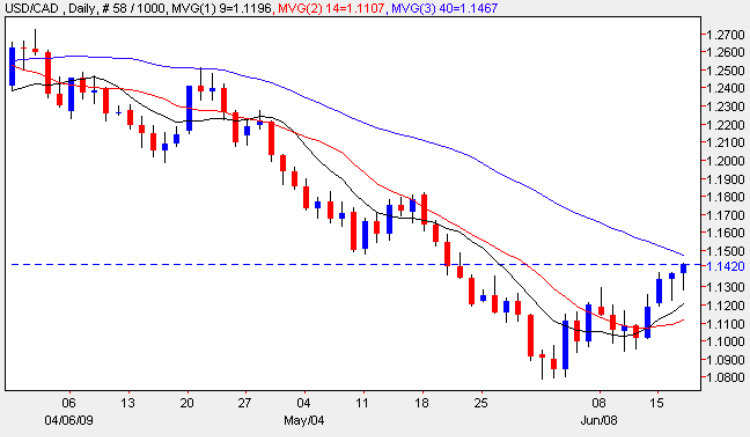 Yesterday’s candle added further weight to our analysis of Monday that the short squeeze in the dollar to cad pair may be more pronounced than at first thought with the bar closing the day with a deep lower wick suggesting that a bullish sentiment in favour of the US Dollar is currently holding sway. The key to any longer term sustained rally will be threefold: first a break above the 40 day moving average, secondly a break and hold above the current resistance now on the horizon at the 1.15 to 1.17 price point, and thirdly continued support from the 9 day moving average which has now crossed the 14 and seems to be providing a cushion to any intra day reversal. In addition we also need to consider the return to strength (or otherwise) of the US Dollar which again will provide a key factor in any sustained rally. For this we need to keep a close watch on the US Dollar Index which in itself is providing us with some finely poised analysis on the daily chart, and indeed the index seems to be re-basing and find some support in the 80 to 81 region. Items of fundamental news on the economic calendar for the US are detailed on the main euro to dollar site and includes the all important crude oil inventory numbers, while for Canada we await the Leading Index figures and Wholesale Sales Data due up shortly. My trading suggestion for this pair is to look for small long positions on a strictly inter day basis using the hourly charts to time your entry and exit points.